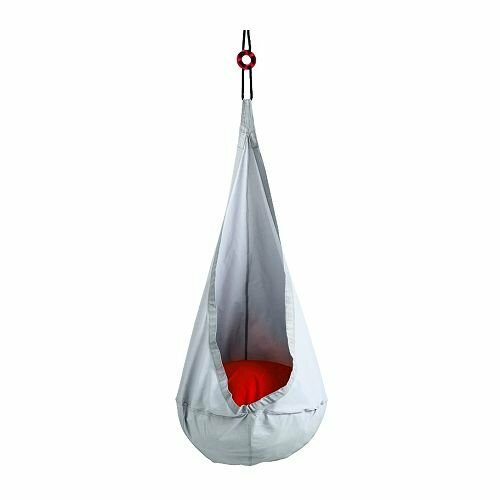 Here is our review of the Ikea’s hanging seat for children called Ekorre, which is a fancy name for a children’s swing. In an Ekorre Hanging Chair, the child can have a quiet place and a welcoming retreat, free from external distractions. 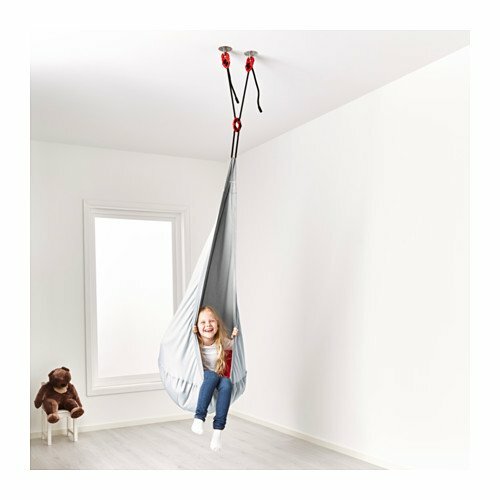 This kind of hanging chairs, where the child is “cocooned” and can swing at the same time, is recommended for the children on the autism spectrum. At the same time, through the spinning and swinging the child can get a variety of sensory inputs it needs. The chair doesn’t take up to much space and doesn’t swing too far because of the suspension methods. But certainly far enough that the child can get sensory input. If you use the suspension set with a swivel, the child can spin it around. The linear rocking forward-and-back motion has a calming and focusing effect, and the spinning movement develops kid’s reflexes and their motor skills. Hand wash warm, 104°F (40°C). Before buying the Ekorre Hanging Chair please read carefully – some do not include the pillow and some does not include ceiling mounting hardware. 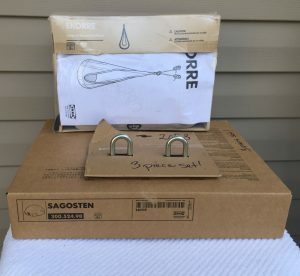 If you buy the Ekorre Swing on Amazon, it comes with the mounting kit- unlike the other swing chairs for kids – so you don’t have to buy it separately. It is a set of two “Ekorre Hooks” and this “hook” is actually just a flat thing with four screws and a hook you can attach to the ceiling but it works really well. 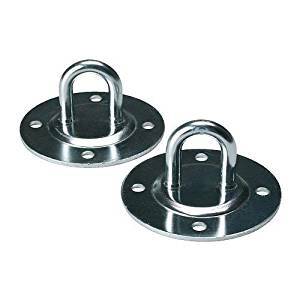 This worthy little thing can be used for suspension of many kinds of swings and hanging chairs, and it is suitable for both indoor and outdoor use. But if you want a rotational device which allows the hanging chair to spin completely freely and safely we recommend the Swivel Power Hook by Byer of Maine. Just like every other IKEA product, Ekorre comes with the assembly instructions. If you buy a used product on eBay, you can find a list of all assembly instructions for all products on the Ikea website. The gray part of the swing is about 5 feet tall -from the top of the loop to the bottom of the seat. 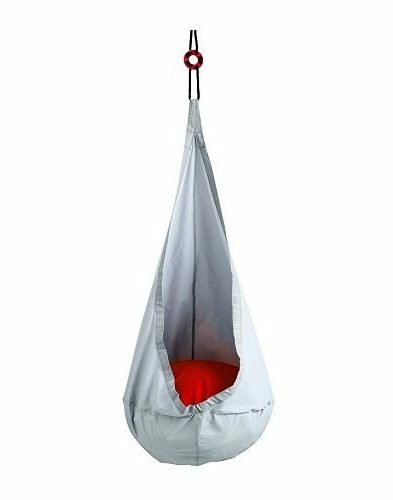 The swing hangs just a few inches from the floor so that your child can feel more secure getting in and out. If you have high ceilings we recommend to replace the cord with a longer one. But you can hang the Ekorre a loft bed, as on the picture above. 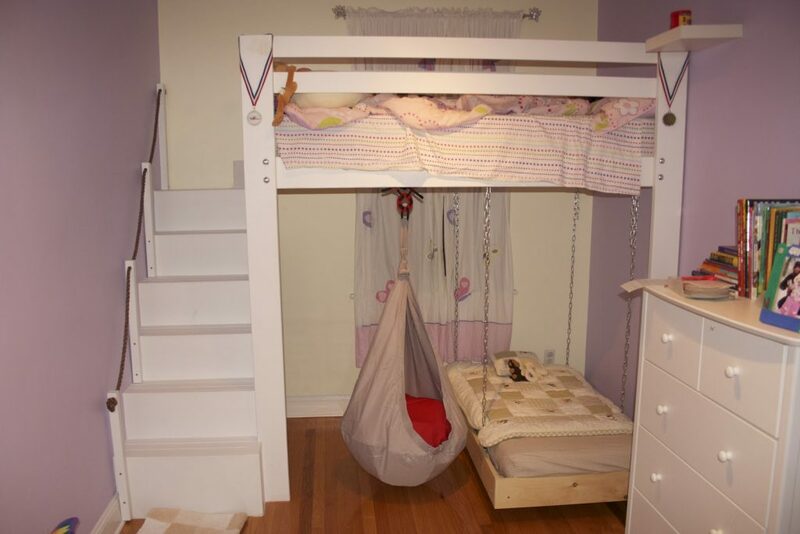 This swing is great for any child’s room, no matter if it’s for kids on the spectrum or a quiet little reading spot. And of course, children love to have fun on swings. The chair has a plastic air seat and you can choose between a hard or soft seating surface by adding or releasing air. We recommend adding cushions and blankets inside for added deep pressure input, relaxation, and meditation. The installation is quite easy and you can remove the chair in one simple step when no longer needed and your child needs a free room. The chair is made of a very sturdy and durable polyester fabric which cleans up very easily with a wet and can be used indoors and outdoors. It is tear-resistant and easy to maintain, but unfortunately not as pleasant on the skin as an organic cotton hammock chair. A comparable product is the Hanging Nest JOKI by La Siesta (our review), which is made of organic fuzz-free organic cotton and Available on Amazon in many different colors at the moment.